The LinkedIn became inaccessible for an hour last night. Few Hours before App.net co-founder Bryan Berg posted that LinkedIn DNS was hijacked but later LinkedIn confirmed that they suffered outage due to DNS issue, not Hack. DNS Hijacking is an unauthorized modification of a DNS server or change of DNS address that directs users attempting to access a web page to a different web page that looks the same, but contains extra content such as advertisements, is a competitor page, a malware page, or third-party search page. Bryan said,"all of your traffic has been sent to a network hosted by this company [confluence-networks.com]. And they don't require SSL, so if you tried to visit, your browser sent your long-lived session cookies in plaintext." LinkedIn tweeted "Our site is now recovering for some members. 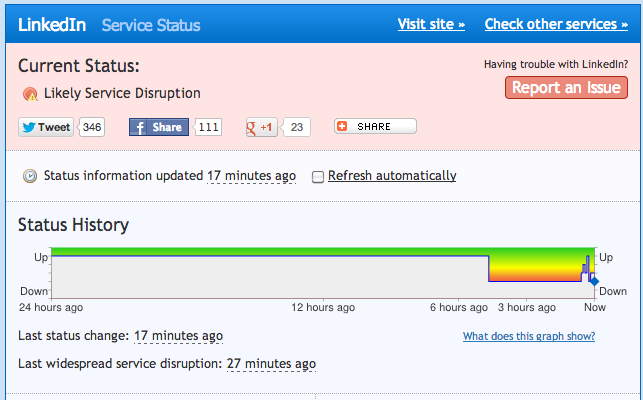 We determined it was a DNS issue, we're continuing to work on it. Thanks for your patience," but provided no further details. LinkedIn users may remember that nearly 6.5 million encrypted passwords were compromised in June 2012 when they were dumped onto a Russian hacker forum.